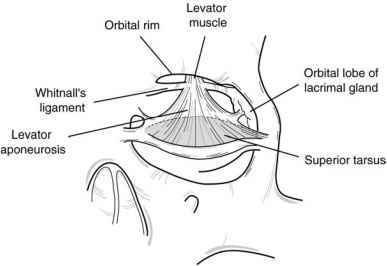 The melolabial (nasolabial) flap is a random-pattern local flap based either superiorly or inferiorly along the melolabial sulcus and cheek-nasal sidewall. The type of tissue movement is lifting either by transposition into the defect or by interpolation. If the intervening skin between the melolabial sulcus and the defect remains intact, then a staged interpolation flap may be necessary. The flap is harvested preserving the subdermal plexus distally and is based on a skin-subcutaneous pedicle; the flap may also be created as an island based only on a subcutaneous island in selected circumstances (i.e., a subcutaneous island melolabial flap). The length-to-width ratio can be as high as 4:1, although flaps over 10 cm have been used augmented by surgical delay. The width of the flap is limited by the ability to close the donor site primarily (usually < 2.5 cm). Harvesting the melolabial flap begins with an incision along the melolabial sulcus from near the corner of the lip to no more than the distal border of the defect. The width of the flap is the same as the width of the defect, and this measurement determines the lateral incision on the cheek outlining the long axis of the flap. This lateral incision will be open-ended to leave a skin-subcutaneous pedicle positioned inferiorly for inferiorly based flaps and superiorly for superiorly based flaps. 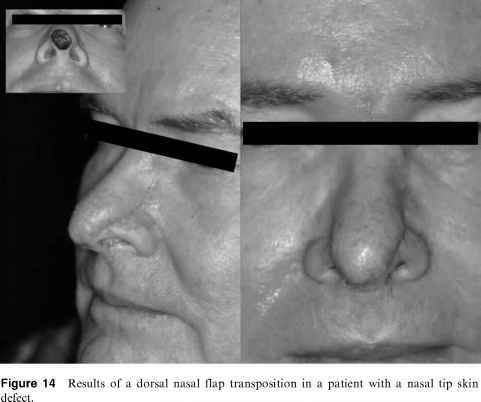 Figure 15 Interpolated nasolabial flap for a partial-thickness defect in the ipsilateral nasal ala. Note in upper right photograph the intermediate stage after initial flap transfer and before final flap division. Lower photograph shows flap inset with shape-retaining suture for the nasal alar flare. The incisions for flap harvest can be hidden in the melolabial fold. There is usually a lot of redundant tissue lateral to the melolabial fold that can be recruited to the flap, especially in older patients. The color match to the skin of the nose is usually very good, second only to the midforehead flap. The melolabial flap accepts cartilage grafts well. 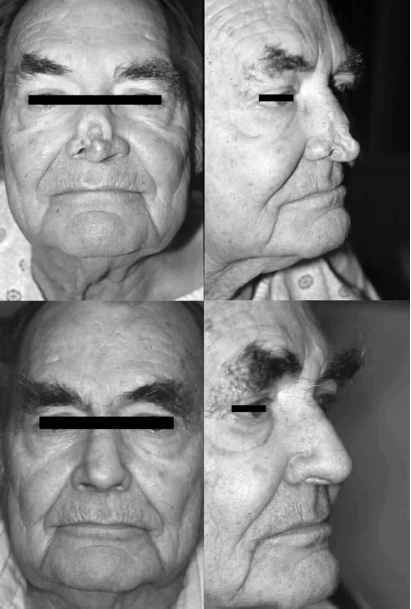 Blunting and asymmetry of the melolabial fold may require surgical revision. Dissecting below the level of the mimetic musculature will place the medial branches of the facial nerve (especially the buccal branches) at risk. Superiorly based flaps are subject to trapdoor and pincushioning deformities because the scar is oriented in a curvilinear fashion near the nasal sidewall. 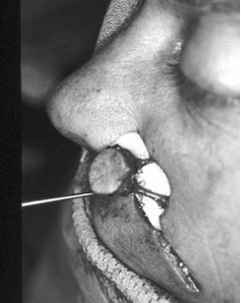 Blunting of the nasofacial sulcus is common, requiring secondary defatting procedures. Inferiorly based melolabial flaps are also subject to trapdoor deformities of the upper lip. 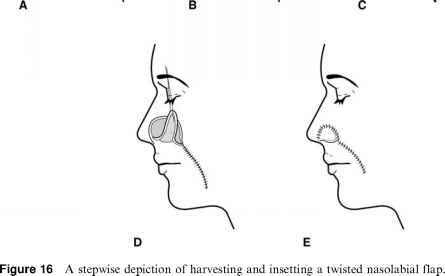 Figure 17 Upper photograph shows final stage of insetting a twisted nasolabial flap for a complete nasal alar defect. Lower photograph shows patient 1 week postoperatively. the medial eyebrow, over the ipsilateral supratrochlear artery, and extending vertically to the hairline. The oblique flap is a paramedian flap that extends across the mid-line of the forehead and along the hairline for additional flap length. Modern refinements to the precise midline forehead flap include its being based on only one supratrochlear artery, allowing the pedicle more freedom to achieve greater flap length. Figure 18 Penned outline of a paramedian (A) and oblique forhead flap (B). The midforehead flap is transferred in stages. The first stage involves interpolation of the flap to the donor site leaving the pedicle exposed over the intervening tissues (Fig. 19). The second stage involves pedicle division with local anesthesia 2-3 weeks later. Pedicle division can be delayed to a third stage if intermediate aggressive thinning and sculpture are required at the second stage. After the pedicle is divided; the remainder of the unused flap should be trimmed and replaced into the forehead as an inverted V no higher than the level of the arch of the eyebrows; replacing the entire unused flap with extension above this level gives a less aesthetic result. The design of the flap should be an exact match to the recipient site defect because forehead skin will not contract. The distal portion of the flap can be thinned to the subdermal plexus (2-3 mm thick), while the proximal part of the flap should include the periosteum (and frontalis muscle) to protect the axial vessels against injury while freeing the flap near its base. Missing cartilage framework should be replaced with grafts from the ear or septum at the time of flap placement in reconstruction of nasal defects. Local septal flaps, such as the septal hinge flap based on | the anterior ethmoidal vessels, are useful to provide inner nasal lining (25). Inner » nasal lining can also be furnished by enfolding the flap and this usually provides good alar and columellar contour if the flap can be sufficiently thinned distally. 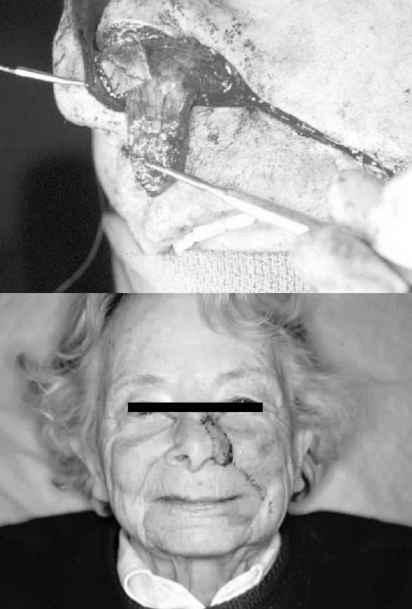 Figure 19 Harvested and transferred paramedian forehead flap in patient A shown in Fig. 18. This is the initial transfer. After 2-3 weeks the flap is divided at the glabella. the hairline. These wounds can be left open to contract over several weeks, resulting in a very acceptable cosmetic result. The main vascular supply to this axial flap is the supratrochlear artery; secondary arterial sources include the angular and supraorbital arteries (27). Midforehead flaps are used for nasal reconstruction; expanded flaps may reach the lip or cheek but they are rarely used for reconstruction of these areas. The midfore-head flap is best reserved for defects of the nose over 2.5 cm in length (28) (Fig. 20). The main disadvantage to the midforehead flap is the vertical scar on the forehead. flap is overly thinned, distal necrosis is ensured, especially in smokers. 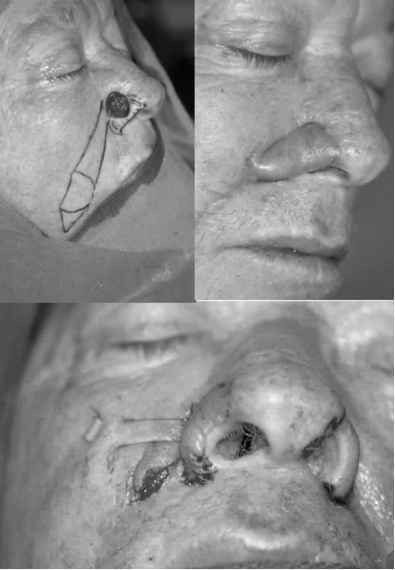 Figure 20 Patient in upper photographs with a deformity of his nasal tip created after cancer was excised and a skin graft applied 15 years earlier. 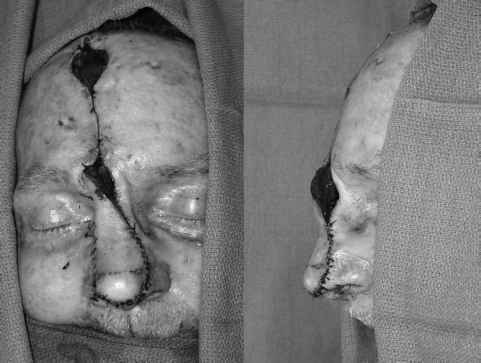 An oblique forehead flap was used to resurface the defect after the skin graft was removed. The result is seen in the lower photographs. an island based on muscular perforating vessels. 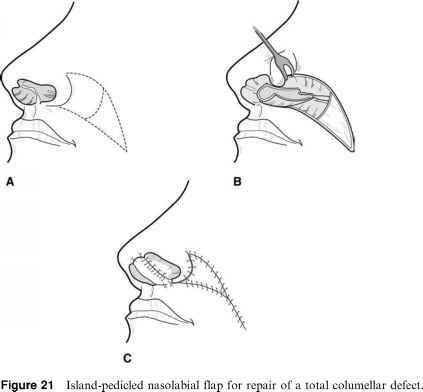 This island of nasolabial tissue is much more mobile than traditional subcutaneous-based nasolabial flaps and can be transposed to donor sites up to 5 cm away, thus extending the indications of the nasolabial flap to include the total restoration of midline nasal and septal defects (30). Perforating vessels (terminal arteries) penetrate the overlying levator labii superioris and nasalis muscles to supply the flap. The location of the donor vessels is adjacent to the piriform aperture, and consists of distal branches of the facial artery distal between the labial and alar arteries and more variable superficial facial veins. After penetrating the muscles, these vessels continue in the subdermal plexus. 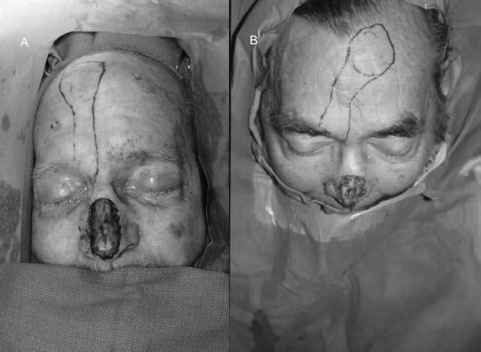 Mobilization of the flap is accomplished through dissection in the nasolabial fold and freeing of the facial artery and vein (Fig. 22). Figure 22 Nasolabial island flap nourished by angular artery and vein. Closure of the donor site as a V-Y advancement can result in a noticeable dual scar in the melolabial crease. Injury to the buccal branches of the facial nerve is a potential complication; however, this has not occurred in reported series (29). Where is your melolabial fold?